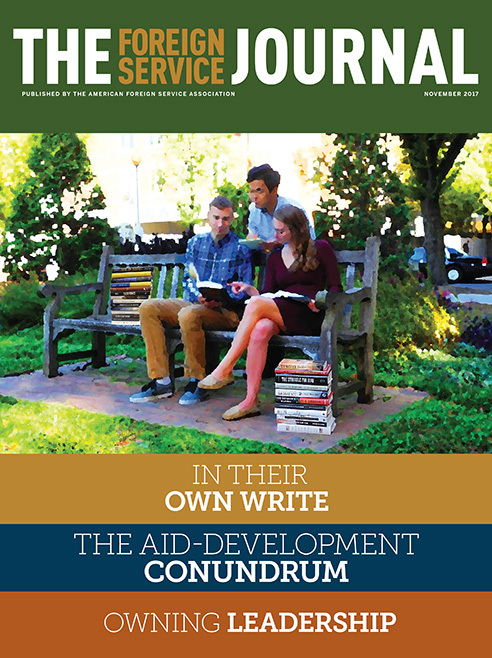 The November issue focuses on Foreign Service authors. Unique experiences are the stuff of Foreign Service life—and compelling literature. One former FSO describes his journey to becoming a writer. There’s no more everyday boredom, but don’t expect writing to be easier than your old job. We are pleased to present this year’s roundup of books by Foreign Service members and their families. Here are recent books of interest to the foreign affairs community that were not written by members of the Foreign Service. Although economists and practitioners have questioned the theory behind foreign assistance to underdeveloped countries for more than four decades, the aid industry is bigger and stronger than ever today.